Entropy restaurant is set in a relocated 120 year old railway shed - think corrugated iron and beautiful wooden floor boards. Everything served is from local South Australian produce (no Coca-Cola here!) with daily menu specials. I'm teaching an 8 week yoga course in this beautiful space, after hours when the restaurant is closed for dining. The launch class (8/4/15) is free and open to everyone. I have a few beginners coming so we will go through the foundation movements in more detail for this first class. You can enroll for this free class online by following the booking link found on my website. 6:35pm - 7:50pm Level I-II vinyasa flow 8 week term. Casual passes available. 8pm-9pm Beginners 4 week course (must pre book - minimum 4 students for course). The 8 week course will develop key "peak" yoga postures over a few weeks to give your body a chance to adapt and learn some new tricks. We'll also be learning some meditation techniques and how yoga can benefit your body and your mind. Address: Entropy - 37 Little Queen Street, Thebarton (access from the end of Queen Street), near the Entertainment Centre. It is located in the gated Adelaide University campus - look out for signage. Tram stop Bonython Park. $120 for full term (8 classes). Please prepay (or register for free 8/4/15 class) by booking online or cash only on the night. There will be limited yoga mats available for hire ($2/each) or purchase on the night. The mats are 6mm long wearing black studio mats which feature 2 different textured sides and are very grippy - perfect for ashtanga or vinyasa style yoga. Cost is $45 per mat, please let me know if you need me to bring one in for purchase. Stand Up Paddleboard yoga - Indoors at Marion Aquatic Centre! This will be lots of fun and not weather and wind dependant. I'll be teaching some of the Tuesday night classes during the year, more information about SUP and learn to SUP on Stand Up Paddle SA website. Yin Yoga - for something completely different (and the opposite to our Yang practice). 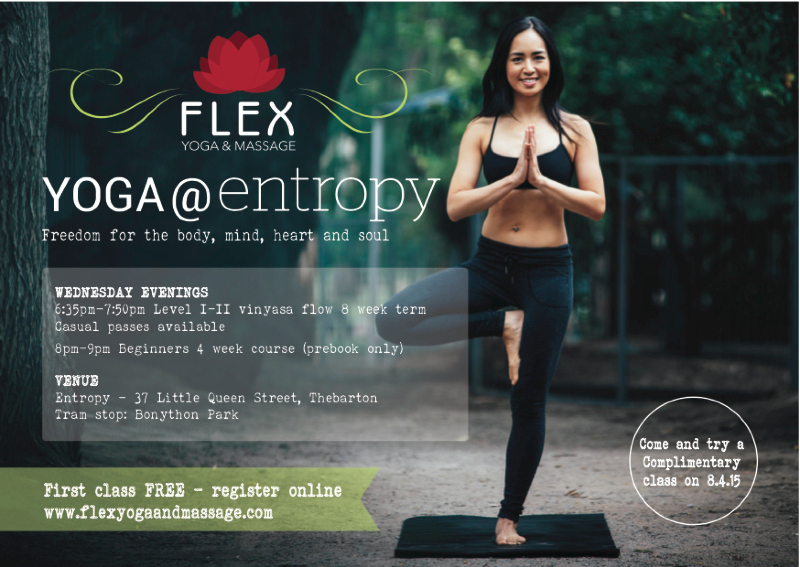 I am hosting master teacher Jennifer Crescenzo (Melbourne) in May with Yin Yoga workshops and also a teacher training course. My cyclist friends will really appreciate the long holds and stretches of this Yin style of practice. Yoga for Cyclists - Next workshop May 17th (Sunday). The workshop will consist of three 1 hour classes that can be booked individually or together. I am including a 1 hour class for "new to yoga" students before the restorative/yin yoga class commences - non intimidating and we'll be breaking down the basic movement patterns of sun salutations and doing some lovely chair yoga stretches. The third class will be a vinyasa flow class with cyclists in mind - something similar to the Lululemon Yoga for Cyclists 4 week course I taught in February. There were over 60 students at each class - thank you so much for your support and energy!